If there is a good way to start the week I am not sure I would recommend sitting under a bucket of iced water – but that was last Monday. 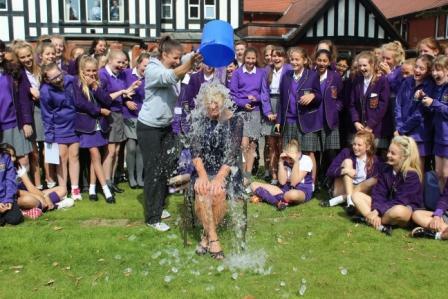 Choosing to do the ALS Ice Bucket Challenge in school, as opposed to the privacy of a back garden, was a moment of madness that I came to regret nervously listening to the countdown. I had been nominated by various friends over the summer but decided that raising awareness of Motor Neurone Disease in school was a good thing and perhaps an entertaining start to term for the students. The photographs show however that Mrs Gough (the purveyor of ice and water) seemed to enjoy it more than anyone else. It was, after all said and done, a bit of fun for a good cause. By comparison the rest of the first full week back has been relatively calm as Year 7’s start to settle and look less lost; the Sixth Formers and Infants settle into their respective comfy bean bags; sports practices are energetically underway; the sounds of instruments and voices echo through Wilmar Lodge Music Centre and Beardwood Bank; ‘Meet the Teacher’ series has begun and new routines are finally becoming embedded for staff and pupils alike. The start of term in September can often be overwhelming and this is true for everyone not just those who have changed schools, Key Stages or year groups. Embracing the new and not being afraid is certainly the best approach to adopt and this applies as much to adults as children – teachers and parents! The UK will change one way or another due to the Scottish independence referendum. Someone’s life will be turned upside down as they are diagnosed with MND. At Beardwood Bank, a young musician will learn a new technique. Ella Holt, Alicia Pursnani, Elysia Kenyon and Annabel Steele moved us to tears with their poetical performance in assembly to remember the victims of 9/11. At Billinge House – a whole new world has appeared for Reception children as they learned new words. Last year’s Upper Sixth Formers will receive their A Level certificates on Friday at Prizegiving, leaving Westholme to embark upon the rest of their lives. We are all apprehensive about change – is natural and normal to be unsure of the things we do not know, do not expect or even do not understand. So as the Autumn term and new school year marches on, I hope it will not take a bucket of cold water to make everyone at Westholme embrace the challenge and opportunities that appear and learn from them!